From the guidelines, as from January 2013: "People do not need to wait for permission to log your EarthCache. Requiring someone to wait is not supported by the EarthCache guidelines. People should send their logging task answers to you, then log your EarthCache. When you review their logging task answers, if there is a problem, you should contact them to resolve it. If there is no problem, then their log simply stands." Active volcanic regions worldwide are common for observation of mineral and thermal waters discharges, which can contribute to social and economic well-being. For example, they are developed as spas, bottled for drinking purposes, and used for heat production for domestic and greenhouses supply. Another useful application of the thermal water geochemistry is for geothermal resources prospection and the monitoring of volcanic activity. The archipelago of the Azores is made of nine islands of volcanic origin in the North Atlantic Ocean, between 37 to 40ºN and 25 to 31ºW. It has an area of 2333 km2 and approximately 237500 inhabitants. The islands are scattered along a 500 km WNW-ESE-trending strip, and emerge from the Azores plateau, a triangular-shaped zone of anomalous and irregular shallow topography. 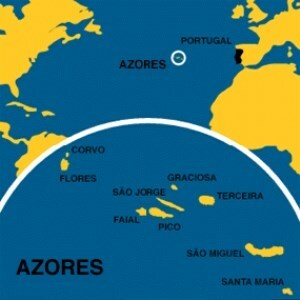 The Azores archipelago lies close to the triple junction between the American, the Eurasian and the African plates. The Azores plateau is traversed by important tectonic structures, like the Mid-Atlantic Ridge (MAR) which divides the Azores islands in two main sectors: the western group of islands, Flores and Corvo, are to the west of the MAR whereas the central (Terceira, Pico, Faial, São Jorge and Graciosa) and the eastern groups of islands (São Miguel and Santa Maria) emerge toward the east of that structure. The geological setting of the Azores archipelago enhances the multiplicity of surface hydrothermal manifestations. Mineral and thermal waters springs as well as fumarolic grounds exist over the archipelago, especially on the islands of São Miguel, Terceira, Pico, Faial, Graciosa and Flores. Groundwater at the Azores occurs in two major aquifer systems: (1) the basal aquifer system, which corresponds to freshwater lenses floating on underlying saltwater, and (2) perched-water bodies. The basal aquifer system is in the coastal area, presenting generally a very low hydraulic gradient, and groundwater extraction is from drilled wells. The perched-water bodies correspond to pervious units, with impermeable to very low-permeability layers at the bottom and, where topographic conditions are favourable, they are drained by a large number of springs on the volcano slopes. Therefore, these aquifers at altitude correspond to confined layers or to leaky aquifers which can lose water through aquitards bounding them from above, with a flow-like water over a succession of roof tiles. São Miguel, the major island of the archipelago and belonging to the Azores eastern group, has an area of about 747 km2 and approximately 125800 inhabitants. Thermal waters in the Azores are first referenced in 1583 but the study of mineral and thermal water discharges in São Miguel started in 1873. The first reference to the therapeutic use of the thermal waters dates from 1614. Owing to the known therapeutic value of these waters several thermal hospitals were constructed, especially in the 19th century. 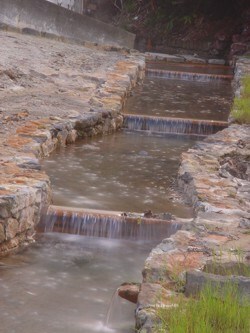 However, the importance of these spas has decreased with time and at present several ‘‘banhos’’ are closed or in ruins. Located in the Furnas area is the Azores Microbial Observatory – AMO (Observatório Microbiano dos Açores – OMIC) is a centre for scientific and technological dissemination, which seeks to promote scientific know-how and accessibility to new technologies. The AMO is an entity responsible for the promotion and dissemination of the importance of microbial life on planet Earth emphasizing existing Microbial biodiversity in the Azores hot springs. The main topic being microorganisms, the AMO seeks to stimulate interest in science and technology, making it accessible to the general public and in particular to young people, since it has an educational support to school programs, as well as being a tourist attraction in the region. The Azores Microbial Observatory is installed in a building with an important heritage and architectural value: old Thermal Bath House – Chalet das Misturas, Furnas, in a central area of “boilers that is easily accessible to students and the general population. The Center also promotes the construction of a scientific culture through conferences and other cultural promotion initiatives related to science and society, for the public in general. The Microbial Observatory of the Azores is managed by Ponte Norte - Cooperativade de Ensino e Desenvolvimento da Ribeira Grande and forms part of the network of science centers of the Azores promoted by the Regional Secretariat of the Sea, Science and Technology. The geology of São Miguel is dominated by three volcanic centres which correspond to the major active trachytic central volcanoes of Fogo, Sete Cidades and Furnas, linked by rift zones. During the last 5,000 years, the activity of the three active central volcanoes is recorded by 57 volcanic eruptions, with an output of 4.6 km3 of rock. The island o S. Miguel is made up of a series of accreted volcanoes, the oldest corresponding to the Nordeste shield volcano, a deeply eroded structure in the easternmost sector of the island, in which the oldest outcrop was dated at about 4 M.a. and the more recent at 0.95 M.a. Volcanic activity has spread from east to west, forming the remaining volcanic complexes from São Miguel, of which the Picos complex is the most recent, corresponding to an area dominated by basaltic volcanism features, marked by scoria cones, many of them aligned along fractures trending WNW–ESE and NW–SE, and where the last eruption occurred in historical times. Hydrothermal manifestations occur mainly in the three active volcanic centres, especially at the Fogo and Furnas volcanoes. Furnas is the easternmost of the three active composite volcanoes on the island São Miguel. This volcano is bounded in the west by the Povoacão caldera, which corresponds to an older and presently inactive volcano, and to the east by the Fogo volcano. The Furnas volcanic centre summit has subsided in several stages of caldera collapse. An older caldera, about 7·5 km wide with a 290-m-depth depression, encloses a younger caldera with a diameter of approximately 5 km. Two smaller subsidence events took place within the younger caldera in the last 5,000 years and explain the origin of the depressions where the Furnas village and the Furnas lake are found today. The growth of the Furnas central volcano started about 100000 years ago, mainly as a result of eruptions of trachytic pumice, and the majority of the outcrops in the western caldera wall postdate a 48000±4,000-year-old lava flow. In the last 5,000 years, at least ten explosive eruptions took place in Furnas, two of which were accompanied by extrusion of trachytic domes corresponding with the major event of the Furnas C deposit. The last eruption at Furnas, dated at 1630 A.D., occurred in the southern part of the caldera and had an explosive phase which produced a tuff/pumice ring complex. In historical accounts by the first inhabitants of S. Miguel, two eruptions were recorded: one in 1439–1443 A.D. and the other in 1630 A.D. The most important thermal features at the Furnas volcano lie on a E-W-trending tectonic lineament which cuts across the Furnas caldera complex. Distributed along this tectonic lineament, two fumarole grounds can be distinguished, one at the Furnas lake margin, 290 m a.s.l., and the other toward the east at the Furnas village, 200 m a.s.l. Another fumarole is in the Ribeira dos Tambores valley. 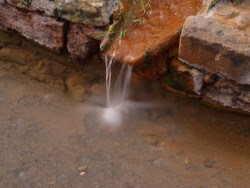 Associated with these fumaroles are boiling water discharges. 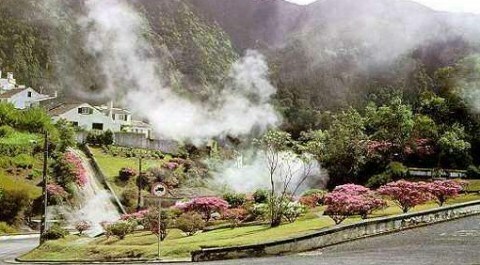 Near the Furnas village, numerous scattered thermal springs can be observed as well as several CO2-rich mineral cold waters. This EarthCache takes you to investigate the ground water of one of the Azores tourist hot spots: the Furnas volcano on the Island of S. Miguel. Ground zero takes you to a fountain that is made up of two spouts each with their own proper name. Whether the temperature of this water is below or above 36.3 ºC. Your correct answers by mail will validate one more find. Cruz, JV, 2003. Groundwater and volcanoes: Examples from the Azores archipelago. Environmental Geology 44: 343-355. Guest JE, Gaspar JL, Cole PD, Queiroz G, Duncan AM, Wallenstein, B, Ferreira T, Pacheco, JM (1999). Volcanic geology of Furnas Volcano, São Miguel, Azores. Journal of Volcanology and Geothermal Research 92 (1-2), pp.1-29. No Ponto zero desta EarthCache vão encontrar duas bicas, cada uma delas com o seu nome próprio. 1 - Qual o nome das duas bicas? 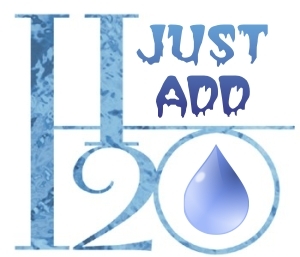 2 - Qual delas é que deita água QUENTE? 3 - A água quente tem uma temperatura acima ou abaixo de 36.3 ºC? Enviem-me as respostas por mail para validar o “found”.